There was all this talk beforehand, and afterwards in some cases, about how it wouldn't be so bad to lose to Leicester, if it meant that they would be Champions, rather than Spurs. I am sorry, but that is not how I felt. I was annoyed as **** that Saints lost this game. Even though the team looked disjointed and at times, disorganised, I always felt that there was enough in the team to beat Leicester. Saints came into the game on the back of that wonderful game against Liverpool. We knew that Koeman would probably return to the three centre back formation to counter the Leicester speed on the break. We were not disappointed. VanDijk, Fonte and Bertrand as the CB's and Cédric and Targett as the wing-backs. Clasie got the nod together with Wanyama in midfield and Davis and Mané were wide with Pellè up front. Interestingly, back on the bench was Jay Rodriguez, but probably a few days too early to expect him to play a part. I had a personal reservation about Clasie getting the nod over Romeu, but the young dutchman was up for it right from the start. The Foxes gameplay seemed to involve putting pressure on Matt Targett, as they continually channelled everything down their right wing. After twenty minutes of withstanding this, Saints started to put on pressure themselves and on the half-hour Pellè heads just over, after good work from Cédric down Saints right wing. Almost immediately there is an even better chance when Sadio Mané is put clean through on goal by Graziano. He does everything well, racing clear and rounding the keeper. All he has to do is put the ball in the net. At that moment Danny Simpson appeared and clearly put his elbow out to stop the ball. The ball hits him on the arm. PENALTY! Oh no it isn't says the referee, Michael Oliver, or rather he just ignores it. And yet another clear cut penalty is denied Saints. Barely time to draw breath and José Fonte decides to shoot from at least 30 yards out and looks to be going in, until the gloved hand of Kasper Schmeichel tips it over. Next it is Clasie's turn, hitting a shot from just outside the box, only to see it sail just over. Four decent chances in the space of less than ten minutes. Straight from this Saints chance, Leicester work the ball down their left wing and Christian Fuchs sends in a dangerous cross. There, rising above the diminutive Jordy Clasie is the Foxes captain, Wes Morgan, who sends a bullet header past the helpless Fraser Forster. Goal. 1-0. That was Morgan's first goal of the season and totally against the run of play. Arse. For the remainder of the first half Saints continue to put pressure on Leicester, but without troubling Kasper Schmeichel. Half-time discussions revolve around the Mané non-penalty incident. The general consensus seems to be that it should have been a penalty. I agree. Ronald Koeman changes things after the break, bring on Dušan Tadić for Matt Targett. Saints change to 4-2-3-1 and Bertrand moves across to left back. 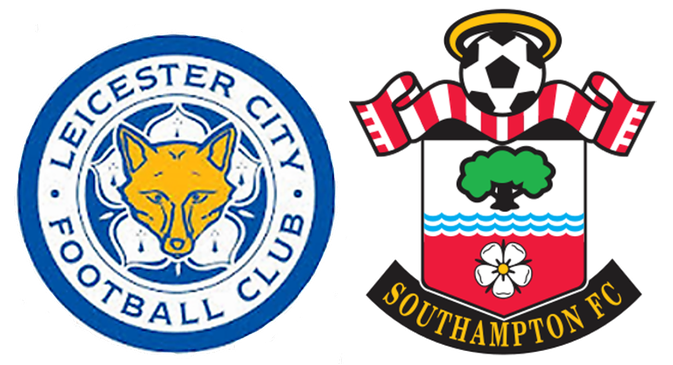 From the kick-off Saints have a let-off when Vardy breaks clean through and Wanyama fouls him. Looks to me like Vic was the last man and could have got a straight red. As it is, he is a lucky man, with referee, Mr. Oliver, choosing to just book him. Drink water and Tadić look to be having a bit of a tussle, which ends with the Leicester player being shown a yellow card. Then comes the moment when Fonte's heart must have been in his mouth. IBO's nixoncomedy put it better than I can when he said "best chance comes on the head of Fonte, a looping, floating, sliding chip that almost sneaks in just under the bar ... Luckily Forster was there to stop the scary near own goal" Make no mistake, that was a simply astounding save from Forster. I hope that José bought him a drink after the match. The game is now end to end stuff and getting a bit heated at times. Fonte and Vardy go head to head. Literally. Just handbag stuff though. Bertrand hits their side netting, but that seems to be as near as it gets. Then comes yet another let off for Saints. Vardy cuts the ball back to Simpson and he has an open goal in front of him. Somehow though, Fraser Forster appears from nowhere and pulls off an even better save than the one from Fonte. Words failed me at this point. With about 15 minutes left, Ronald Koeman then makes a double change, Charlie Austin for Clasie and James Ward-Prowse for Davis. Going for it then. Tadić gets booked in the increasingly tense atmosphere, but neither side is making much impression now. As the minutes tick by Leicester seem content to hold Saints at bay. They even manage to bring on ex-Saint, Nathan Dyer as the final seconds tick by. At the final whistle my thought were that Saints didn't deserve to win this match by any stretch of the imagination, but they didn't deserve to lose either. They finished the day still in 7th place in the Premier League and if they still harbour hopes of a European campaign, then they are going to have to put together a very strong finish to their 2015-16 season. Final thought. Are Saints players too nice? You seldom see them getting in the referees face. If they behaved like so many other clubs players, would the referee have given the penalty today? Just a thought.